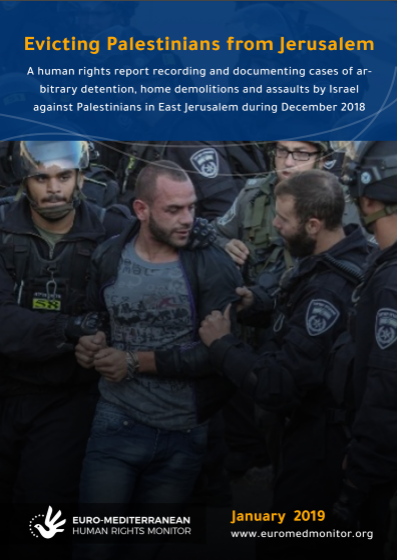 Geneva - The Israeli authorities follow a racist policy in the pursuit and arrest, trial and sentencing of Palestinians, concludes a new human rights report by detailing cases of arbitrary detention, home demolitions, and assaults against Jerusalem’s Palestinians in December 2018. Issued by the Euro-Mediterranean Human Rights Monitor and titled, “Evicting Palestinians from Jerusalem,” the report points to the Israel’s continued violations of the rights of Palestinians in Jerusalem since the decision by US President Trump to relocate his country’s embassy to Jerusalem in December 2017. These violations include increased arbitrary arrests, house demolitions and displacement, as well as re-arrest of Palestinian prisoners once they leave prison gates. Israeli settlers, accompanied by Israeli forces, also continue to storm the Al-Aqsa Mosque, provoking the feelings of Muslims in the religious compound, finds the report. The Israeli forces practice arrest of Palestinians as a tool of punishment and intimidation without any legal or moral justification, and not as a means of prevention, states the report. In a clear and explicit violation of the law, the Israeli occupation subjects some prisoners to administrative detention for six months, without an indictment, as a form of open punishment. In an arbitrary move, administrative detention can be extended every six months, the report further states. Israel’s Public Prosecutor's Office intentionally refrains from arresting and/or interrogating Israeli citizens who attack Palestinians or post hate speech on social media to incite against Palestinians. On the other hand, Palestinians are criminalized, and hundreds of children and young men are arrested under charges of ‘throwing stones,’ said Sarah Pritchett, Euro-Med’s spokeswoman. The racial discrimination against Palestinians is also shown in interrogation and arrest procedures favouring Israelis, said Sarah Pritchett. A wedding ceremony of an Israeli extremist, known as the “Hatred Party,” was held on December 2015, where settlers raised photos of the Dawabsha family with a picture of the child Ali Al-Dawabsha, the only survivor of the burning carried out by the settlers against his family. In this case, the police interrogated the groom and seven others. The courts did not extend their detention in the same way they did with al-Fakhouri and his friends even though the settlers' ceremony also serves as an explicit incitement. Hamza Melhes, a Jerusalem resident, said that the Israeli forces stormed his house and entered the room of his sisters before they wore their headscarves. When Hamza and his brother Khaled objected, the police beat him and his brother Khalid, pushing one of his sisters to the ground and breaking her mobile phone because of filming soldiers while they beat her brothers. Several cases where Palestinians were re-arrested at the time of their release were documented. These include Mahmoud Abd il-Latif, Adnan al-Rajabi, Mahmoud Jaber, Sbeih Abu Sbeih, and Ya'qub Abu Asab, the report reveals. The re-arrest of these prisoners aims to prevent any festive public appearance by their relatives and friends after their release. Even though such celebrations are legal, these prisoners still were re-arrested, with the court imposing conditions for their release, such as house arrest and eviction from Jerusalem, to prevent these celebrations. Dozens of testimonies indicate that the Israeli occupation authorities have implemented an arbitrary policy against the Palestinians in Jerusalem, which, according to the report, aims to evict them. This is effectively happening through the lack of building permits and the demolition of their homes and shops. In addition, the Israeli authorities impose huge sums of money as fines on Jerusalem’s Palestinians when the Municipality demolishes their homes, forcing them to demolish their homes with their own hands, in order to avoid such expenses. Also, the policy of sudden demolition without warning leaves families’ belongings under the rubble, including furniture and valuables. At the same time, Israel’s Jerusalem Municipality has not yet issued a general organizational plan to regulate construction in East Jerusalem, thus forcing residents to build without permits. According to local reports and human rights organizations, the Israeli authorities carried out 68 demolitions of residential houses and 178 commercial establishments throughout 2018, notifying over 125 households and commercial establishments of demolition orders. Also, 10 families have demolished their own homes to avoid the expenses incurred by the Municipality demolishing their homes. Over 144 people were evicted from their homes because of demolitions, including about 58 minors. The demolitions carried out by the occupation forces in Jerusalem are illegal and constitute a war crime, said Enas Zayed, Euro-Med’s legal adviser. Jerusalem, on the one hand, is governed by the UN General Assembly's Resolution 181 setting out the partition plan and affirming Jerusalem’s status as falling under international protection, not Israel’s protection. Even in accordance with the subsequent UN resolutions issued by various UN bodies, including the Security Council and the General Assembly, East Jerusalem is an occupied territory, and the presence of the Israeli authorities in, as an occupying power is illegal. It is understood that it is the duty of the occupying power, in accordance with the Fourth Geneva Convention, to manage the areas under its control, dictated by the interests of the population under occupation. However, the Israeli authorities have been violating Palestinians’ rights to their land by depriving them of building new homes, and thus forcing them to emigrate. This policy represents an arbitrary act of discrimination and a form of prohibited settlement under international humanitarian law, Zayed concluded. Palestinians have also been subjected to settler attacks. Nidal al-Faqih, 39, from Shu'fat refugee camp, was injured on 14 Dec. 2018 when he was driving a bus from Jerusalem to a nearby Israeli settlement after he was attacked by a group of settlers. He was injured and bruised in the back, foot, eye and the rest of his body. On December 19, 2018, late at night, a group of extremist settlers attacked Palestinian homes in al-Gharableh Neighborhood in Beit Hanina, next to which the settlement of Pisgat Ze'ev was built. They damaged more than 20 vehicles owned by Palestinian residents, and wrote racist slogans on walls calling for revenge against the Palestinians. The Euro-Mediterranean Human Rights Monitor calls on the international community to protect Jerusalem and its Palestinian population as residents of an occupied territory under Security Council and General Assembly resolutions. The nonprofit youth-led organization further calls on the international community and all countries that respect the Charter of the United Nations to dissuade the American administration from its arbitrary decision to relocate its embassy to Jerusalem, which gave the occupation a green light to increase violations in the Holy City.